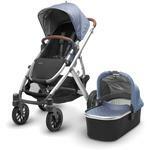 UPPAbaby Vista Stroller - FREE Shipping! The VISTA takes your child on the road in style. 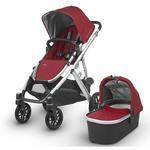 Designed to grow with your child, the VISTA is the ideal strolling solution from birth through the toddler years. It adapts easily to your growing family with solutions for a big brother or sister. 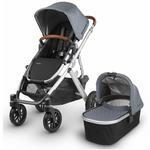 The NEW VISTA stroller keeps first time parents and growing families moving forward with ease and style. Building on the success of the original must-have stroller, the new VISTA stroller?s intuitive design folds easily, adapts as your family grows in a variety of new configurations, and maneuvers like a single stroller. It can comfortably hold 2 MESA infant car seats, 2 bassinets, or 2 toddler seats (the new RumbleSeat reclines and can be used rear or forward facing). Transport up to three children easily by adding a PiggyBack Ride-Along board. Our newly designed RumbleSeat can go rear facing, forward facing and recline ? it?s the multitasking stroller seat you have only dreamed of. It rolls with the punches, and it does it with strength. While one child is enjoying a snack, the other can be enjoying a catnap. One can face forward, and and the other face backward. 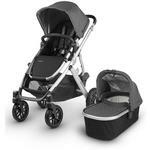 Your family has multiple needs, and your VISTA stroller has the flexibility and comfort to provide an enjoyable ride. 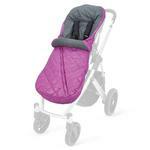 Add our PiggyBack ride-along board and you are outfitted for three babes in tow. You are blessed with not one little bundle of joy, but two! 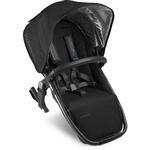 The VISTA now allows for 2 infant car seats, 2 bassinets or 2 toddler seats revolutionizing travel with twins! It?s hard to believe how quickly they grow and change. Your baby is now pulling on the rail of her crib and may actually skip walking and go right from crawling to running. Big brother isn?t quite ready to abandon his stroller throne and walk along side. The VISTA expands to accommodate two toddlers of varying ages. With the RumbleSeat your little one can nap while your older child takes in his surrounding. 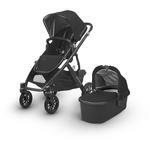 Convert your VISTA stroller to a double in-line stroller with ease and style. Designed exclusively for 2009 and later model VISTA strollers, the RumbleSeat converts a single stroller to a double in-line stroller in seconds. Whether it?s a quick stroll to the supermarket or a long, leisurely walk through the park, this exclusive seat provides maximum comfort and style for parents? precious cargo.. 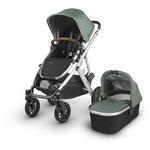 Convert your VISTA stroller to a double in-line stroller with ease and style. Designed exclusively for 2009 and later model VISTA strollers, the RumbleSeat converts a single stroller to a double in-line stroller in seconds. Whether it?s a quick stroll to the supermarket or a long, leisurely walk through the park, this exclusive seat provides maximum comfort and style for parents? precious cargo. A perfect fit with the VISTA, the BabyGanoosh footmuff keeps your child toasty warm no matter what elements mother nature brings your way. Now you and your little one can enjoy the outdoors even on brisk days. Exterior is windproof and water repellent. Machine washable.